If you close your eyes and picture the perfect Tuscan landscape, what comes to mind will likely look a lot like the area surrounding the Fattoria di Fubbiano. If your picture includes rolling hills, tall cedars, ancient farmsteads, vineyards, olive groves, and a small hill town in the distance, then you have it just right. The direct translation of the Italian word fattoria is farm - but direct translations don't always capture the essence of a word. A fattoria can be anyplace involved in agriculture - from the classic farm with rows of vegetables and barnyard animals to a terraced hillside where grapes and olives are grown. The Fattoria di Fubbiano is the latter - 130 some acres of vineyards and olive groves tucked into the hills 15 kilometers (9 miles) east of Lucca just below the hilltop town of San Gennaro. A fattoria has existed in this spot for a long time - the property dates to the late 1600s. Local tax records list an even earlier date for the first cultivation of vines and olive trees here. Ownership of the fattoria has changed hands many times, with the current owners purchasing the antique property in 2002. 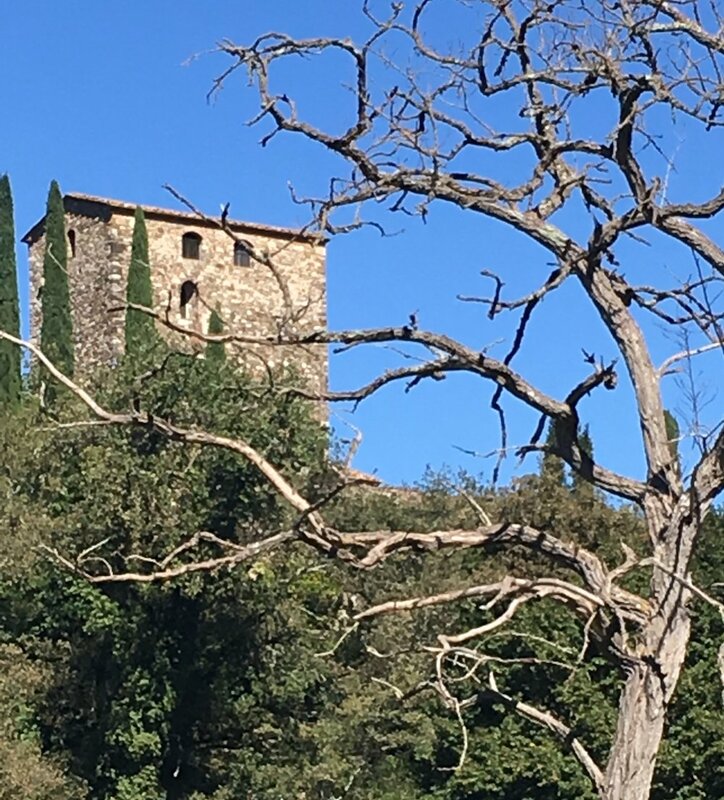 They have since restored the fattoria buildings and original villa, converted some buildings into guest quarters and tended the gardens and view terraces. The biggest project was the construction of a new and very modern cantina. This is where the harvested grapes arrive and where the Fubbiano wines are produced and bottled. The original cantina, a beautiful building with arching brick ceilings, now serves as an events space. Several wines are produced at Fattoria di Fubbiano, including three reds, two whites, and a Vin Santo. All are DOC-certified (which assures place of origin as being from the Lucchese hills, as well as variety of grape and quality). Also produced is a rosé (labeled Schiller, the name of the family that owns the fattoria) and a super Tuscan (labeled I Pampini and a personal favorite). Along with these excellent wines, the grapes are used to produce grappa and a wine vinegar. The wines are well respected locally and internationally. Thirty percent of the produced wines are exported to the United States. My visit to the Fattoria di Fubbiano was to tour the grounds and winery and then to participate in a cooking class in the old cantina building. The winery tour was informative and interesting (even if it was hard not to be distracted by the amazing views of the surrounding vineyards and hillsides). The cooking class, offered as an afternoon cultural excursion by Lucca Italian School, was a delight. Together we prepared an appetizer of fried zucchini flowers with a filling of ricotta, basil, and pecorino cheese, a handmade-filled pasta (Tordelli Lucchese), a fragrant roasted pork, and a classic local dessert (Zuppa Lucchese). After the meal prep was complete, our group of about 20 shared an aperitivo of Fubbiano wines and the crisp, melt-in-your-mouth zucchini flowers out on a wisteria-covered terrace overlooking a stunning Tuscan landscape. 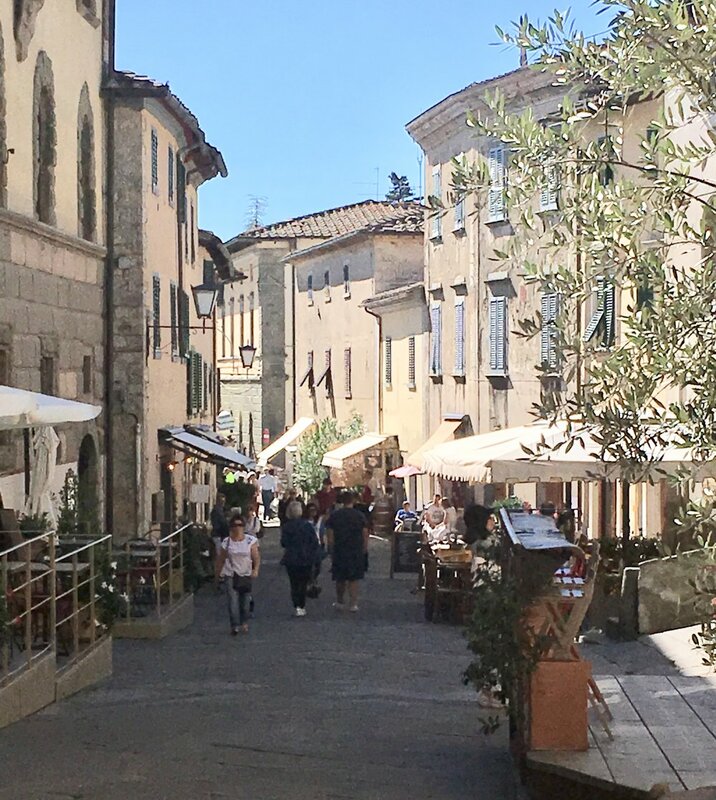 Sitting on that terrace in the soft light of a spring evening, sipping wine, and talking to the interesting people who come to Lucca to study Italian, was a special kind of wonderful.